Dream Makers Vacation Services co-owner, Amy McHugh and dream agent Robyn Ayers, are spending this week in beautiful Orlando at Walt Disney World. Dream Makers Vacation Services is one of the top travel agencies in the US and we were honored to be selected to attend the 2018 EarMarked Owner’s Summit. The week has been full of exciting new information about Disney Parks and Resorts and we can’t wait to share it with our valued clients. 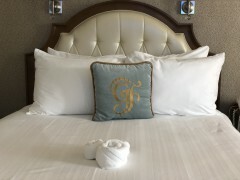 We are staying at Disney’s Grand Floridian Resort & Spa during the summit. The resort is a beautiful deluxe property in a prime location. You are just one stop from Magic Kingdom on the monorail located at the resort or a quick boat ride. There are views of the Polynesian Resort, lagoon and Magic Kingdom from the property. You can even see the Magic Kingdom fireworks from the resort if you have a theme park view room or you can simply stroll down to the dock and watch. 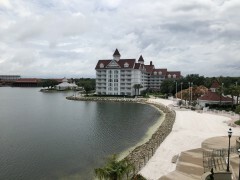 There are many room categories at the Grand Floridian with some located in the main building and some in the outer buildings placed along the lagoon on the property. The main building has only club level rooms with standard and theme park views as well as one and two bedroom suites. The outer buildings have garden, lagoon, theme park and club level rooms. We are staying in an outer building lagoon view room in the Big Pine Key building. We have a fantastic view of the lagoon, Polynesian Resort and Disney’s Wedding Pavilion from our 4th floor balcony. Our room has 2 queen beds and a sleeper sofa so it can accommodate up to 5 guests. Our building is quiet and located close to the main building which is perfect.